14 “When you come to the land that the Lord your God is giving you, and you possess it and dwell in it and then say, ‘I will set a king over me, like all the nations that are around me,’ 15 you may indeed set a king over you whom the Lord your God will choose. One from among your brothers you shall set as king over you. You may not put a foreigner over you, who is not your brother. 16 Only he must not acquire many horses for himself or cause the people to return to Egypt in order to acquire many horses, since the Lord has said to you, ‘You shall never return that way again.’ 17 And he shall not acquire many wives for himself, lest his heart turn away, nor shall he acquire for himself excessive silver and gold. 18 “And when he sits on the throne of his kingdom, he shall write for himself in a book a copy of this law, approved by the Levitical priests. 19 And it shall be with him, and he shall read in it all the days of his life, that he may learn to fear the Lord his God by keeping all the words of this law and these statutes, and doing them, 20 that his heart may not be lifted up above his brothers, and that he may not turn aside from the commandment, either to the right hand or to the left, so that he may continue long in his kingdom, he and his children, in Israel. 18:1 “The Levitical priests, all the tribe of Levi, shall have no portion or inheritance with Israel. They shall eat the Lord's food offerings as their inheritance. 2 They shall have no inheritance among their brothers; the Lord is their inheritance, as he promised them. 3 And this shall be the priests' due from the people, from those offering a sacrifice, whether an ox or a sheep: they shall give to the priest the shoulder and the two cheeks and the stomach. 4 The firstfruits of your grain, of your wine and of your oil, and the first fleece of your sheep, you shall give him. 5 For the Lord your God has chosen him out of all your tribes to stand and minister in the name of the Lord, him and his sons for all time. 6 “And if a Levite comes from any of your towns out of all Israel, where he lives—and he may come when he desires—to the place that the Lord will choose, 7 and ministers in the name of the Lord his God, like all his fellow Levites who stand to minister there before the Lord, 8 then he may have equal portions to eat, besides what he receives from the sale of his patrimony. 20:1 “When you go out to war against your enemies, and see horses and chariots and an army larger than your own, you shall not be afraid of them, for the Lord your God is with you, who brought you up out of the land of Egypt. 2 And when you draw near to the battle, the priest shall come forward and speak to the people 3 and shall say to them, ‘Hear, O Israel, today you are drawing near for battle against your enemies: let not your heart faint. Do not fear or panic or be in dread of them, 4 for the Lord your God is he who goes with you to fight for you against your enemies, to give you the victory.’ 5 Then the officers shall speak to the people, saying, ‘Is there any man who has built a new house and has not dedicated it? Let him go back to his house, lest he die in the battle and another man dedicate it. 6 And is there any man who has planted a vineyard and has not enjoyed its fruit? Let him go back to his house, lest he die in the battle and another man enjoy its fruit. 7 And is there any man who has betrothed a wife and has not taken her? Let him go back to his house, lest he die in the battle and another man take her.’ 8 And the officers shall speak further to the people, and say, ‘Is there any man who is fearful and fainthearted? Let him go back to his house, lest he make the heart of his fellows melt like his own.’ 9 And when the officers have finished speaking to the people, then commanders shall be appointed at the head of the people. 10 “When you draw near to a city to fight against it, offer terms of peace to it. 11 And if it responds to you peaceably and it opens to you, then all the people who are found in it shall do forced labor for you and shall serve you. 12 But if it makes no peace with you, but makes war against you, then you shall besiege it. 13 And when the Lord your God gives it into your hand, you shall put all its males to the sword, 14 but the women and the little ones, the livestock, and everything else in the city, all its spoil, you shall take as plunder for yourselves. And you shall enjoy the spoil of your enemies, which the Lord your God has given you. 15 Thus you shall do to all the cities that are very far from you, which are not cities of the nations here. 16 But in the cities of these peoples that the Lord your God is giving you for an inheritance, you shall save alive nothing that breathes, 17 but you shall devote them to complete destruction, the Hittites and the Amorites, the Canaanites and the Perizzites, the Hivites and the Jebusites, as the Lord your God has commanded, 18 that they may not teach you to do according to all their abominable practices that they have done for their gods, and so you sin against the Lord your God. 17:14When thou art come unto the land which the LORD thy God giveth thee, and shalt possess it, and shalt dwell therein, and shalt say, I will set a king over me, like as all the nations that are about me; 17:15Thou shalt in any wise set him king over thee, whom the LORD thy God shall choose: one from among thy brethren shalt thou set king over thee: thou mayest not set a stranger over thee, which is not thy brother. 17:16But he shall not multiply horses to himself, nor cause the people to return to Egypt, to the end that he should multiply horses: forasmuch as the LORD hath said unto you, Ye shall henceforth return no more that way. 17:17Neither shall he multiply wives to himself, that his heart turn not away: neither shall he greatly multiply to himself silver and gold. 17:18And it shall be, when he sitteth upon the throne of his kingdom, that he shall write him a copy of this law in a book out of that which is before the priests the Levites: 17:19And it shall be with him, and he shall read therein all the days of his life: that he may learn to fear the LORD his God, to keep all the words of this law and these statutes, to do them: 17:20That his heart be not lifted up above his brethren, and that he turn not aside from the commandment, to the right hand, or to the left: to the end that he may prolong his days in his kingdom, he, and his children, in the midst of Israel. 18:1The priests the Levites, and all the tribe of Levi, shall have no part nor inheritance with Israel: they shall eat the offerings of the LORD made by fire, and his inheritance.18:2Therefore shall they have no inheritance among their brethren: the LORD is their inheritance, as he hath said unto them.18:3And this shall be the priest's due from the people, from them that offer a sacrifice, whether it be ox or sheep; and they shall give unto the priest the shoulder, and the two cheeks, and the maw.18:4The firstfruit also of thy corn, of thy wine, and of thine oil, and the first of the fleece of thy sheep, shalt thou give him.18:5For the LORD thy God hath chosen him out of all thy tribes, to stand to minister in the name of the LORD, him and his sons for ever.18:6And if a Levite come from any of thy gates out of all Israel, where he sojourned, and come with all the desire of his mind unto the place which the LORD shall choose;18:7Then he shall minister in the name of the LORD his God, as all his brethren the Levites do, which stand there before the LORD.18:8They shall have like portions to eat, beside that which cometh of the sale of his patrimony. 1When thou goest out to battle against thine enemies, and seest horses, and chariots, and a people more than thou, be not afraid of them: for the LORD thy God is with thee, which brought thee up out of the land of Egypt.2And it shall be, when ye are come nigh unto the battle, that the priest shall approach and speak unto the people,3And shall say unto them, Hear, O Israel, ye approach this day unto battle against your enemies: let not your hearts faint, fear not, and do not tremble, neither be ye terrified because of them;4For the LORD your God is he that goeth with you, to fight for you against your enemies, to save you.5And the officers shall speak unto the people, saying, What man is there that hath built a new house, and hath not dedicated it? let him go and return to his house, lest he die in the battle, and another man dedicate it.6And what man is he that hath planted a vineyard, and hath not yet eaten of it? let him also go and return unto his house, lest he die in the battle, and another man eat of it.7And what man is there that hath betrothed a wife, and hath not taken her? let him go and return unto his house, lest he die in the battle, and another man take her.8And the officers shall speak further unto the people, and they shall say, What man is there that is fearful and fainthearted? let him go and return unto his house, lest his brethren's heart faint as well as his heart.9And it shall be, when the officers have made an end of speaking unto the people, that they shall make captains of the armies to lead the people.10When thou comest nigh unto a city to fight against it, then proclaim peace unto it.11And it shall be, if it make thee answer of peace, and open unto thee, then it shall be, that all the people that is found therein shall be tributaries unto thee, and they shall serve thee.13And when the LORD thy God hath delivered it into thine hands, thou shalt smite every male thereof with the edge of the sword:12And if it will make no peace with thee, but will make war against thee, then thou shalt besiege it:14But the women, and the little ones, and the cattle, and all that is in the city, even all the spoil thereof, shalt thou take unto thyself; and thou shalt eat the spoil of thine enemies, which the LORD thy God hath given thee.15Thus shalt thou do unto all the cities which are very far off from thee, which are not of the cities of these nations.16But of the cities of these people, which the LORD thy God doth give thee for an inheritance, thou shalt save alive nothing that breatheth:17But thou shalt utterly destroy them; namely, the Hittites, and the Amorites, the Canaanites, and the Perizzites, the Hivites, and the Jebusites; as the LORD thy God hath commanded thee:18That they teach you not to do after all their abominations, which they have done unto their gods; so should ye sin against the LORD your God.19When thou shalt besiege a city a long time, in making war against it to take it, thou shalt not destroy the trees thereof by forcing an ax against them: for thou mayest eat of them, and thou shalt not cut them down (for the tree of the field is man's life) to employ them in the siege:20Only the trees which thou knowest that they be not trees for meat, thou shalt destroy and cut them down; and thou shalt build bulwarks against the city that maketh war with thee, until it be subdued. What did God require of Kings to prevent them from going astray? What special privileges did the Levites receive in their inheritance? Would God choose you to fight His battles? Why? 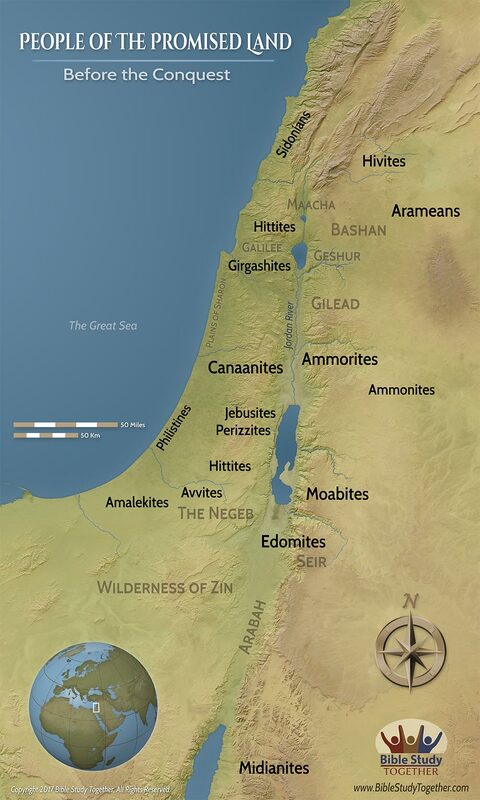 How were the Israelites to treat those in the land that they were to inherit different from those far away? Find fearless people who trust God to fight alongside you.